Lynette Ciervo, 45, is painfully familiar with the word “no.” So is her daughter, Haley. “"She has an amazing amount of curiosity and energy,"” says the Rockville, Maryland, mom about her toddler. “"Haley’'s a delight—, but she'’s the kind of kid I was having to say no to all day long.”"
For a while, the incessant “no'”s were creating power struggles between mother and toddler. "“She thrives on being in control, and she would meet my every “no” with her own,"” Ciervo recalls. "“We were in a constant state of negative interactions. It was not a fun place to be. "” Even worse, the negativity was affecting Haley'’s sense of self. "“When she started telling me, ‘I'’m bad,’ I realized I was making her put that label on herself by saying no, no, no, no. I believe firmly in limit setting, but this was not working. "” That’'s when Ciervo started reserving “no” for high-stakes moments— - like when Haley starts running through the parking lot. Claire Lerner, director of parenting resources at the national nonprofit research center Zero to Three, points out that “no” might seem like the ultimate limit-setting tool because it feels final and non-negotiable— which might be why, according to one UCLA study, the average toddler hears that word some 400 times a day. But, says Lerner, it does nothing to help young children with their main developmental task figure out acceptable ways of doing what they have to do developmentally - —explore their world. When you set limits by using strategies that don'’t rely on “no,” kids learn other skills too, —among them, language: Studies show that children whose parents speak to them and explain things, especially in everyday situations, develop a richer and more nuanced vocabulary than those who hear only simple commands like “no.” Dr. Alice Sterling Honig, Professor Emerita of Child Development at Syracuse University and an expert in early language development, says, "“If you just say ‘no’ to a young child all the time, that child doesn'’t learn to use language to reason with you and others." Explaining slowly at the child'’s level is so important.” "Just make the explanation clear, slow and easy to understand," Honig adds. Like Haley Cierbo, some kids get angry when they hear the word “no.” Anger makes them shut their ears, and then they can'’t listen to reason. If you have a child like this, you’'ve probably experienced the supermarket scenario. He asks you for candy while you'’re shopping. You say, “No, no candy before dinner.” He stamps his feet. You say “no” again, more sharply this time. And before you know it, he’'s having a meltdown in the frozen foods aisle. The solution? Frame the “no” as a “yes” whenever you can. “Yes, you can have candy after dinner. Let’'s go look for an apple for now.” According to Bruce Grellong, chief psychologist at the Jewish Board of Family and Children’s Services, the “yes” response helps children learn an important concept: “I can handle my negative emotions about not getting what I want when I want it.” Of course, if you don't want your kid to have candy at all, you'll have to try a different strategy. As a professor of dispute resolution at Northwestern University’s Kellogg School of Management, Leigh Thompson knows that flat refusal is not the best way to ease your opponent’s resistance. So the Evanston, Illinois mother of three avoids using the word “no.” Instead, when she doesn'’t like something that one of her three kids is doing, she uses (—and models) —her conflict-resolving skills. "“Imagine your child is banging his toy on the coffee table,"” Thompson offers. "“You might tell him, '‘You’'re hurting the table when you bang on it, and that makes me sad. Please stop banging the table. '’ What you’'re saying is, ‘'Here'’s what I don’t like, here’'s what you can do to fix it. '’ You'’re showing your child that other people feel as much ownership over their pieces of the world as he does, and that helps him become an empathic human being.”" By the time Thompson'’s two oldest boys were preschoolers, she says, they were resolving their own disputes using the tools that they’'d learned from mom. Your preschooler is throwing his ball in the living room, and you know you'’re going to hear a crashing sound pretty soon. Instead of saying "“No! No balls indoors,"” try, “"You can roll the ball indoors or take it outside and throw it.”" Offering choices - —“It’'s time to turn off the TV; would you prefer to do a puzzle or cook with me?”— - helps children feel that they have some power, says Lerner. “It says, ‘I trust you to be a good thinker and decide what to do next.’” Especially between the ages of one and three, kids who are encouraged to make simple choices in their lives develop a sense of independence and competence that will help them succeed as they grow. But avoid overwhelming a young child with too may options: for toddlers and preschoolers, two is just right. And only give your kid choices that you feel comfortable with. Constantly saying no makes toddlers feel as if they'’ve lost your affection— that’'s what upsets kids and makes them dig in their heels,” says family therapist and Playful Parenting author, Dr. Lawrence Cohen.“ But if you stay connected with your child, she'’ll want to cooperate, he advises. Help her find an activity that’s as much fun as the one that'’s off-limits. For example, your immediate response to the sight of your toddler emptying a box of cereal on the floor would probably be “"No! Stop that! "” Instead of only seeing the mess she’'s making or the annoyance she'’s causing, you can say, “"No [smiling], let's go and find something else to do that’'s fun and interesting. "” Cohen says that as children reach the age two or so, you can start to say, "“No, but do you have any ideas about what we can do instead? "” “But if your child’'s angry, wait for her calm down first,” he cautions. Every night at bedtime, your little boy calls you in to ask for one thing after another - —it'’s the “glass of water” routine run amok. And each time, with rising impatience, you say, “"No, now go to sleep." You feel like your kid'’s just being demanding. And in fact, he is —for a reason. Dr. Joe Ritchle, head of the Early Childhood Behavior Project at the University of Minnessota’s Center for Early Education and Development, explains: “"The majority of ‘bad’ behaviors happen for one of two reasons: Attention-getting or avoidance. The trick is to figure out which it is. "” In other words, does your son need some extra moments with you before you say goodnight (maybe bedtime is always rushed)? Or is he afraid of being left alone in the dark? First, try giving him more attention, Richle advises. If he still demands more after you'’ve read him a story, maybe he’'s avoiding the scary darkness. You can teach him to say ‘please leave the light on’ or ‘please stay with me while I fall asleep.’ And you can try bargaining: You’ll come and check on him after he’'s spent ten minutes trying to dose off; then every day, add more minutes. By helping him know what he really wants, you empower your child to communicate his needs. Meanwhile, you'’re also helping him to learn that he can tolerate a little bit of fear. Two-year-old Henry keeps poking his baby sister; his dad keeps telling him to stop. Why won'’t he? 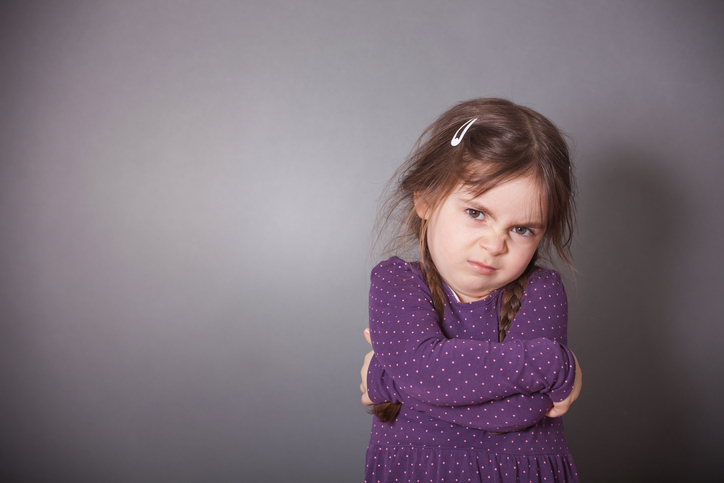 "Some children can'’t stop what they’'re doing, even when you tell them to, because they don'’t know what to do instead," says parent educator Elizabeth Crary, the author of "Without Spanking or Spoiling." You have to help them figure it out. Henry, for example, needs his dad to say “"Give Sarah a kiss,"” or some similar suggestion; then he'’ll have an image in his mind of something to do instead of poking. "The approach helps your child long-term, too," Crary explains. “It gives him the building blocks for learning self-restraint.“ Younger toddlers, she adds, might need you to help them do what you’'re asking of them as you make your request: If she'’s hitting the cat, say, “Gentle,” while you guide her hand in a stroking motion. Do this enough times, and she'’ll begin to figure it out for herself. Sometimes you have to say “no”— - in fact, Grellong believes that it’'s the only way to set a firm limit, as long as you say it in a matter-of-fact tone of voice. But, he insists, your “no” must be followed up. Take the example of Susie, who’'s grabbing Tommy’'s shovel in the playground. You can tell her, “No. I understand that you really want to play with that toy, but it’s Tommy'’s turn now.” By letting your child know that you know she’'s frustrated, you tell her that it'’s okay to feel this way, and you help her learn to deal with her emotions. At the same time, use simple language to communicate why you'’re saying no. Later, when children start to put together sentences of three or four words, you can talk to them about some of the more complicated social rules - "—“Ask Johnny if you can borrow his shovel when he'’s ready."